At the time of Adolf Hitler's accession to power in 1933, the British Air Staff and the scientists who were working with them began to be concerned about the unavailability of a method to detect the approach of hostile aircraft at a distance, or of following their course in overcast weather or at night. When Harry Wimperis, the Director of Scientific Research at the Air Ministry, and Albert Rowe, his scientific assistant, pressed Lord Swinton, Secretary of State for Air, for some new action to solve the problem, the latter responded by appointing a committee consisting of Sir Henry Tizzard, Professor Archibald Hill and Professor Patrick Blackett (three scientists with wide knowledge and experience) to work with the Air Staff to find a solution. Wimperis was also a member of the committee and Rowe was its Secretary. The committee's attention soon focused on research work that had been conducted by the Department of Scientific and Industrial Research, where E. V. Appleton (later Sir Edward Appleton) of the University of Cambridge had successfully measured the "Heaviside Layer" in the atmosphere by the use of radio range-finding. This research was followed by Appleton's adoption, and wide extension, of the "Pulse" methods which had been pioneered by the American physicists, Gregory Breit and Merle Tuve in the 1920s. Proceeding from this earlier research, R. A. Watson-Watt (later Sir Robert Watson-Watt) and his colleagues at the Radio Department of the National Physical Laboratory, produced,in early 1935, the first detailed proposals for the practical location of aircraft by radio, and from that moment the development of radar (as it came to be known) would commence. 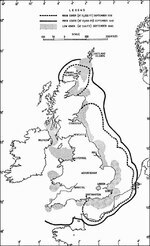 Considering the great complexity of the research involved it is somewhat surprising that, within six months, by September 1935, the first radar station (the first radar installation anywhere in the world) was in operation and aircraft approaching Great Britain's coastline were being detected as far as 50 miles away. By September 1938, the detection range had been increased to 150 miles, effectively making the Air Defence of Great Britain (ADGB) far more efficient and London now reasonably well protected against a surprise air attack. Then, on Good Friday, 1939, when the Germans marched into Prague, Czechoslovakia, there began a 24-hour radar watch along the entire coast from Scapa Flow to Portsmouth, and by the time war was declared, in September 1939, an entire chain of secret coastal radar stations had been completed. Meanwhile, at the Radio Department of the National Physical Laboratory others were pioneering alternative uses for radar. Here, Arnold Wilkins would develop I. F. F., the complex method of identifying aircraft, "Friend or Foe", and Edward Bowen was working on the development of airborne radars. In addition, great strides were being made in the application of radar for the needs of the Navy and Army. Since before the war Dr. William Butement had been working on a radar capable of locating ships as targets for coast defence artillery, and had made a very great advance in directional accuracy. From Butement's work would eventually emerge the shipboard fire-control radar that would play such an important factor in wartime Naval operations. C. Horton was a prime leader in this development work, whilst John F. Coales made noteworthy contributions to gunnery radar. Another spin-off of from the work on coastal artillery radar would be the Chain Home Low (C.H.L.) system; an essential device for the successful air interception of low-flying aircraft. At around the same time P. E. Pollard was proving that radar range-finding could be much more accurate in tracking aircraft than the big optical range-finder currently in service. From Pollard's work would come the G. L. (Gun Laying) set for unseen A. A. fire. Additionally, it was soon realised that airborne radar might become an effective weapon in the war against the U-Boats. Bowen and R. Hanbury-Brown were two of the scientists who were prominent in the development of sets designed specifically to locate ships and surfaced submarines. The first serious usage of radar, however, came during the Battle of Britain when the chain of coastal radar installations made an invaluable contribution in the successful interception of approaching enemy bombers. By night the practice of Air Interception (A. I.) begun by Bowen's team in combination with the use of Ground Control Interception (G. C. I. ), which Dr. Denis Taylor had developed along with the Plan Position Indicator (P. P. I.) added another valuable asset to the nation's defences. Another important use for radar discovered at this time was that it could by used to enable the searchlights (for spotting enemy aircraft at night) to open directly onto their target. This was known as Elsie (SLC) and was largely the work of Canadian Harold Larnder and W. S. Eastwood. But all this, decisive as it proved in defence, was only a beginning. From the earliest days it had been realised that greater accuracy, and in particular the capability to discriminate between the echoes from natural objects and those from the target, were required. Nothing but a narrow beam instead of the former "floodlighting" technique could give the results desired and this meant much shorter wave-lengths, on high sensitivity. Fortunately, Great Britain was well placed to deal with this problem. From March 1939, ninety leading physicists, (men who had spent their lives in the abstruse problems of splitting atoms and "spinning" electrons) had been attached to the coastal chain stations. Australian Professor Mark Oliphant (later Sir Marcus Oliphant) of Birmingham University, supported by Dr. Herbert Skinner of Bristol, inspired their co-workers by their insistence upon the urgent need for centimetric wave-lengths and by their own experimental skill. A tremendous drive followed until in July 1940, Professor J. T. Randall (later Sir John Randall) of Birmingham produced a cavity magnetron which was the first high-power generator of centimetric waves anywhere in the world. The cavity magnetron, eagerly seized upon by the radar researchers, was supplemented by an equally novel receiving valve evolved by Dr. R. W. Sutton. The result was a centimetric radar set which, in turn, became the precurser of both the shipborne set, vital to the war against the U-boat, and the centimetric G. L. equipment. Dr. Landale was responsible for the ship-borne set, while the Assistant Director of Scientific Research, Professor John Cockcroft (later Sir John Douglas Cockcroft) and Dr. E. S. Shire led the work on developing the centimetric G. L. equipment. The first successful application of centimetric radar was the A. I. device carried by night fighters which enabled the pilot to direct himself straight onto an enemy bomber. Professor Philip Dee, A. L. Hodgkin (later Sir Alan Hodgkin) and W. E. Burchem were the leading figures in its development. A parallel project by Professor Dee and his team resulted in a centimetric A. S. V., a device which, when carried in a Coastal Command aircraft, could direct it accurately towards a surfaced U-boat. This, when used in combination with ship-borne brothers in destroyers and corvettes greatly aided the Allies in the ultimate defeat of the German submarine fleet (particulaly during the Battle of the Bay of Biscay) at a time when it seemed as if the whole war effort might by strangled by their deadly activities. Further slight changes at the hands of Professor Dee, Skinner, Bernard Lovell and others led to the production for the Air Force of H2S. This truly remarkable device revealed visually a continuous picture of the unseen ground over which the aircraft was passing greatly adding to navigational accuracy. Gee: A navigational system which enabled bombers to know exactly where they were at any time en-route to or from Germany. It was this device which made the 1,000-bomber raids possible and which increased bombing effectiveness some three to five-fold. By mid-1944 Gee had become the universal navigational aid, for both maritime and aviation usage. Oboe: A system which gave the bomber its position even more exactly than Gee and by which the signal to drop its bombs on the target in Germany could be given from the base in England. Its accuracy provided the means to permit precision attacks to be made on munition factories in the Ruhr and enemy missile sites along the coast of Europe. Rebecca-Eureka: A "radar beacon" which, when installed on the ground by airborne "Pathfinder Teams", was to provide a means for directing following transport aircraft to deliver airborne forces precisely into their specified drop zones. In practice this device proved less than effective, during the Allied invasion of Normandy, France, due largely to an inability of US pathfinders to deploy the beacons accurately. Finally there were many other men, and women too, who contributed to the research and development of these devices but whose names are perhap not generally associated with any specific devices but who contributed to the general pool of knowledge and experience out of which they grew. A kind of radar university grew up, among which John Radcliffe of Cambridge and Dr. L. Huxley of Nottingham played a leading role. There was also Geoffrey Dummer, whose fertile brain devised over seventy types of radar training equipment, the use of which saved the RAF £50,000,000 worth of aviation spirit during the war. The work of these brilliant engineers and scientists working alongside the Radio Board (and its two principle committees, the Radio Production Executive, and the signals organisations of the three services) as one great team would enable these remarkable systems to be brought against the enemy to such good purpose that they provided many distinct strategic and tactical advantages to the Allied armed forces. In 1940-41 a radar station was built on North Hill in Minehead, Somerset. Arthur C. Clarke lived within walking distance of the station and according to Wikipedia he was the head of the Radar Development Unit for the RAF. Was this station built for him to carry out research & development? My father worked at crystal palace during the war as a glass blower making specialised equipment in connection with radar and television. My uncle, Herbert jack Morris worked on radar under Oliphant at Birmingham (as head Glass blower) He went to Berkeley during WW2 to work on Manhattan where he built worked on cavity magnatrons. Back in the uk he continued on radar then became head of Glass, Plastics and Ceramics at Harwell. We had a working magnatron hidden in the piano!